We Learn You About earn Money Easy way, And Get Latest Free Software's And Games..And Also Like A PDF Books. If you need to gain access to a Hotmail account but have forgotten your password, I’d recommend using the Hack Hotmail Password program to recover the password. It’s a fairly simple tool that will help you gain access to an account that you can’t seem to get into anymore. This tool was created to help you change the password to old accounts of yours that you can’t access anymore, a friends account who has given you permission to access their account, or possibly a child who you feel may need to be watched a bit more closely. If this tool is used for any other purpose I am not to be held responsible for your actions, so use this responsibly. While it may seem self-explanatory, many people struggle to get this program to work so I’ll just go over it briefly for you. 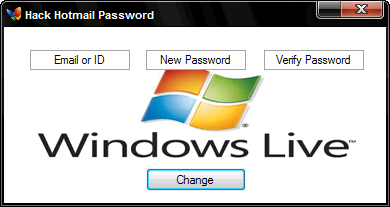 Hack Hotmail Password is a powerful tool that will contact Hotmail and attempt to change the password of the account you have entered. Simply fill in the email box with the email address of the account you’d like to change the password of, then fill in the new password you would like in the next two boxes.